The highly anticipated addition to Roland’s AC-series amp family has arrived! Loaded with high-performance speakers and 90 watts of power, the AC-90 provides a rich, powerful sound while remaining lightweight for easy transport. The AC-90 employs a stereo 2-way speaker system that delivers transparent highs — great for the built-in multi-band stereo chorus — while also providing incredibly powerful low-frequency performance. Loaded with high-performance neodymium speakers and 90 watts of power, the AC-90 provides a rich, powerful sound while remaining lightweight for easy transport. The highly anticipated addition to Roland’s AC-series amp family has arrived! Loaded with high-performance neodymium speakers and 90 watts of power, the AC-90 provides a rich, powerful sound while remaining lightweight for easy transport. The AC-90 employs a stereo 2-way speaker system that delivers transparent highs — great for the built-in multi-band stereo chorus — while also providing incredibly powerful low-frequency performance. The AC-90 isn’t just any new amp on the block … it’s the long-awaited addition to Roland’s industry-leading AC-series amp family. 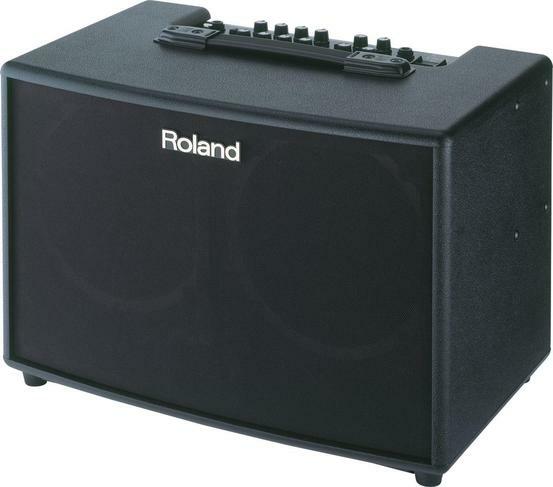 Roland’s reputation for world-class sound, amazing performance, portability, and top-quality construction in the AC series are all upheld in this stunning new amplifier. With 90 watts of stereo power (45W+45W) driving top-quality speakers, the AC-90 delivers exceptional full-range performance — from shimmering, crystal-clear highs to full-impact bottom end. This amp is more than capable of cutting though a wall of sound. Enjoy maximum volume without feedback, thanks to the AC-90’s sophisticated ANTI-Feedback feature. This allows you to roam the stage with confidence — even with 90 watts of powerful sound at your back. The AC-90’s onboard stereo effects benefit from Roland’s decades of industry-leading R&D. Experience the amazing spatial depth and lush sound of the stereo multi-band chorus, complete with newly developed WIDE mode. Delay and Reverb are provided as well, and can be controlled via footswitch. In addition to its amazing acoustic-guitar amplification qualities, the AC-90 can also function as a portable PA system thanks to its dual-channel architecture, sub output and phantom-powered Microphone input. Sing and play guitar through one convenient amplifier, with impressive power and full-range performance.